Books Include: 61 short stories from each fourteener, 8 lengthy chapters detailing specific climbs, a 3D digitally enhanced satellite map of Colorado with all its fourteeners, tips and tricks for climbing with a dog, the history of 14er dogs, peak preservation pages, remembrance pages for fallen canine friends, and much more. Mountain ranges are color-coded for easy recognition. Sample page spreads below are examples of this. The book itself is very thick and heavy, and is the size of TWO coffee table books combined into one. The early stages of the book have several introductory pages with special features. This particular spread discusses how the book is not a linear read, but still can be read that way if desired. The History of 14er Dogs section covers sixteen dogs over one hundred years. The 2007 Culebra Peak dogs are discussed in chapter 4. Sawyer is not featured because the book covers his history. Colorado mountain ranges in the book are color-coded for easy recognition and understanding. The Front Range uses purple as its color. All range lead in pages include photo panoramas. Each peak within the mountain range will be color-coded on two pages, include a short story, a few photos, the peak ranking, Sawyer's dog paw peak rating, and the date the peak was climbed. The book contains eight lengthy chapters. 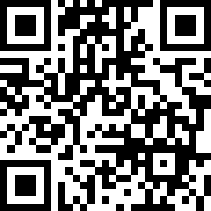 Each chapter chronicles one or more climbs in greater detail. Chapter 7, shown here, discusses the Snowmass Mountain and Little Bear Peak climbs. 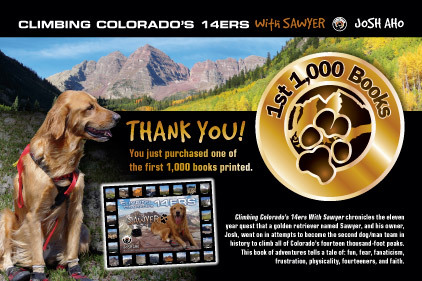 14er Canine LLC is owned by Joshua Ian Aho and is the company under which the book title, Climbing Colorado's 14ers With Sawyer, was published. 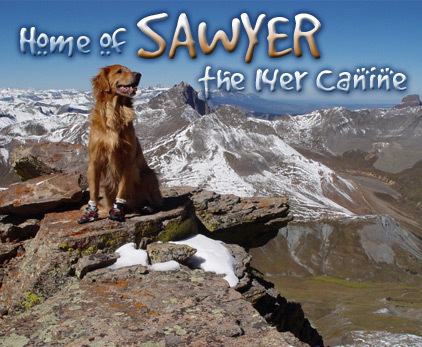 Synopsis: Climbing Colorado's 14ers With Sawyer chronicles the eleven year quest that a golden retriever named Sawyer, and his owner, Josh, went on in attempts to become the second dog/man team in history to climb all of Colorado's fourteen thousand-foot peaks. This book of adventures tells a tale of: fun, fear, fanaticism, frustration, physicality, fourteeners, and faith.